JOHNSON CITY, Tenn. -- Federal agents are trying to determine why a man pulled over for speeding in Tennessee was carrying a cache of weapons including two submachine guns and 900 rounds of ammunition. 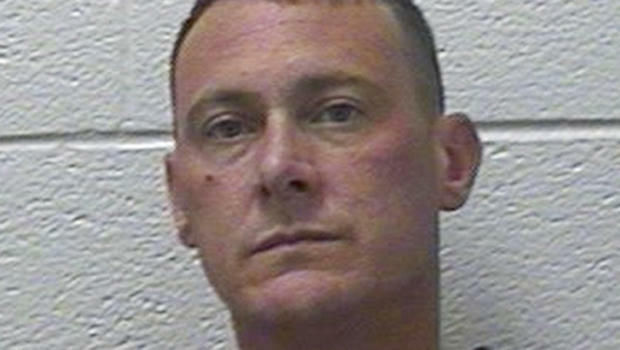 Deputies found Scott Edmisten, 43, of Johnson City, carrying a .357-caliber Magnum, a loaded .45-caliber semi-automatic, a .223-caliber fully automatic assault rifle, a .308-caliber fully automatic assault rifle, more than 900 rounds of ammunition, and survival equipment, Washington County Sheriff Ed Graybeal said. Graybeal asked the U.S. Bureau of Alcohol, Tobacco and Firearms to help investigate, since the automatic weapons aren't registered and lack serial numbers. He told CBS affiliate WJHL that Edmisten had apparently modified the AR rifles to make them automatics. "Anytime you have several firearms and several hundred rounds of ammunition in a vehicle, that always causes a concern," said Michael Knight, an ATF spokesman. Authorities still haven't determined why Edmisten was carrying all that firepower, but they "don't see a connection" to recent mass shootings, Knight said. The arrest came a day after Stephen Paddock killed at least 58 people and wounded more than 500 in Las Vegas, firing down on a music festival crowd from a high-rise hotel suite. Some of the 23 guns in the suite were equipped with devices that enable a rifle to fire continuously, like an automatic. "It's not connected to any of the other national incidents, but timing obviously was a concern," Knight said. Knight said investigators are tracing where Edmisten's weapons came from. "Our priority is reducing violent crime on the front end, so that's the other thing we're looking at, along with motive: Were these items going to be used for a criminal act or were they just being transported from one area to another area?" Graybeal said Edmisten threatened his arresting officer and lunged toward investigators trying to question him. He's jailed without bond on charges of possessing prohibited weapons, speeding, and felony evading arrest. It's unclear if he has a lawyer. Graybeal told WJHL that Edmisten is not cooperating with investigators. "He's not talking to us," he said. "Not talking to us about anything."